I can't tell you exactly how much of this queso dip I can eat in one sitting, because I would never be able to look you in the eye again! 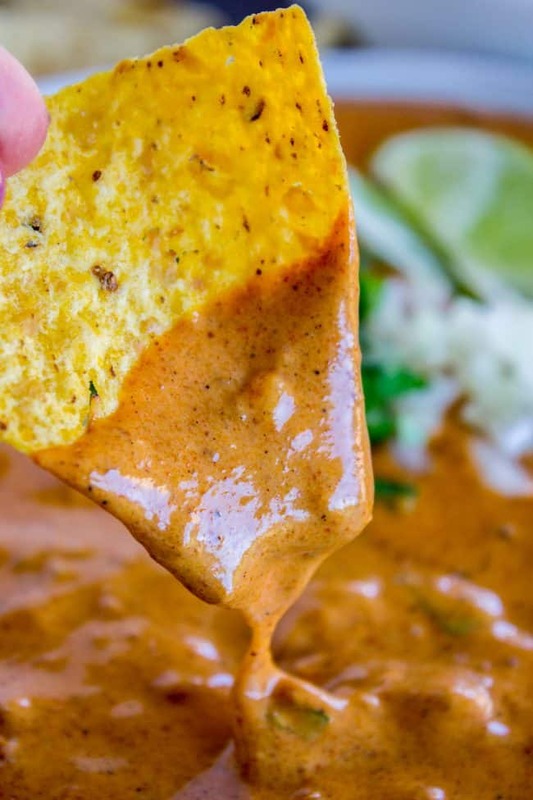 This is a copycat of the queso dip recipe served at Chili's, made in the slow cooker or on stove top. It's absolutely addictive and perfect for game day! Place the lid on top and set to high heat for 1 hour. Stir once halfway through. Or you can cook it on low for 2-3 hours, stirring once halfway through. The longer it sits, the more time the flavors have to marry, so feel free to make this ahead of time! It reheats in a jiffy (microwave, stove top, or in the slow cooker). Serve with tortilla chips and garnishes! Chop the Velveeta and add to a large pot. Add all the other ingredients and turn the heat to low. Stir frequently until it's all melted. Serve with chips and garnishes! *My sister Laura has been making this dip for years, and she says Wolf brand no bean chili is the best. I live in CA and couldn't find it at the store, so I used Hormel and it was delicious! This basic recipe can be found all over the internet, but I think it might have come from this Top Secret Restaurant Recipes Cookbook. Not 100% on that! My sister Laura gave me the recipe for her version.